Give a brand-new twist to your grandma's traditional Puranpoli recipe. Replace the usual chaanaa stuffing with khajoor and til stuffing. Rich in calcium and iron, this recipe is an apt dessert option for new mothers to be. • Add 4 tablespoons of milk to wheat flour and knead together using enough water to make soft dough. • Divide the dough into 4 equal parts and keep aside. • Toast the til (sesame seeds) on a medium flame, till they are lightly brown, and keep it aside to cool. • Grind the til, sugar, and dates together, coarsely. • Divide the mixture into 4 parts and keep aside. • Take the dough and roll it out into a 3" (diameter) circle. • Place one portion of the filling in the centre of the circle. • Pull it together from all sides and seal tightly. • Roll out a small puranpoli with the help of a little flour. • Heat a non-stick pan. 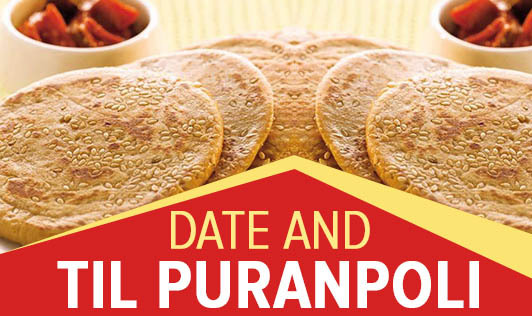 • Cook the puranpoli on the non-stick pan until it is slightly brown on both sides. • Serve hot with milk.